As far as optics are concerned, only direct viewing telescopes are needed with the rigid bronchoscope. Naturally, they should contain a light source. It is not necessary to have a series of 30°, 60° and 90° lenses in stock, since it is easier simply to use a fiberoptic bronchoscope through the open tube rather than resort to these sophisticated telescopes. However, it is necessary to have several direct viewing lenses including at least 4 and 5.50 mm diameter telescopes. 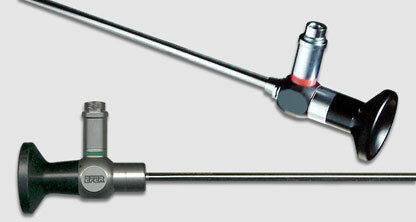 Smaller diameter telescopes are necessary for pediatric cases.